Birthplace : Dallas, Texas, U.S.
Clayton Edward Kershaw is a left-handed pitcher for the Los Angeles Dodgers of Major League Baseball. His nickname is 'Kid K', due to his tendency to strike out batters out a high rate while being in his early twenties. In 2010,on december 4, Clayton married his girlfriend of seven years, Ellen Melson. Kershaw attended Highland Park High School, where he established himself as an elite high school prospect in 2006 when he posted a 13–0 record with an ERA of 0.77, and recorded 139 strikeouts in 64 innings. In a playoff game against Justin Northwest High School, Kershaw pitched an all-strikeout perfect game. He was selected by USA Today as "High School Baseball Player of the Year", and was also the Gatorade National Player of the Year for baseball. Kershaw was also friends with future Detroit Lions Quarterback Matthew Stafford. Entering the 2006 MLB Draft, Kershaw was considered the top high-schooler available. The Los Angeles Dodgers selected Kershaw with the 7th overall pick in the draft. He turned down a scholarship at Texas A&M to sign with the Dodgers, with a bonus estimated at $2.3 million. The $2.3 million bonus was the largest to any Dodgers amateur at the time, which was eventually topped by Zach Lee in the 2010 MLB Draft. Kershaw continued to show dominance with the Gulf Coast League Dodgers. In two starts in 2006, he fanned 21 batters in 11 innings.In may 2008, Kershaw's minor league contract was purchased by the Dodgers, and he was added to the active roster. Tony Jackson, a well-respected beat writer for the Dodgers, called Kershaw's debut the most anticipated start by a Dodgers pitcher since Hideo Nomo debut in 1995. He made his debut on May 25, starting against the St. Louis Cardinals. He pitched six innings, allowed two runs and recorded seven strikeouts. When he debuted, Kershaw was the youngest player in Major League Baseball, a title he held for one full year. In 2009, despite an 8–8 record, he led the major leagues in opposing batting average (.200), opposing slugging percentage (.282), and hits per nine innings (6.26). He also posted an ERA of 2.79 and 185 strikeouts. Kershaw also walked 91 batters, which was second most in the National League. Coming off of back-to-back National League Championship Series, the Dodgers and Kershaw had hefty expectations coming into 2010. Kershaw started the season to mixed reviews. In April, he posted a 3.07 ERA, but did so by walking 22 batters in 29 innings. On May 4th, Kershaw had his worst start of his career against the Milwaukee Brewers at Dodger Stadium. Kershaw threw 57 pitches in just 1 1/3 innings and retired only four of the 13 batters he faced -- including the pitcher and was booed loudly upon being pulled from the game. Kershaw said after the game, "I didn't give our team any kind of chance. It's just not a good feeling to let your teammates down, let everybody down. It stings, it hurts. I've got to figure things out." In february 2011 the Dodgers named Kershaw as the Opening Day Starter for the 2011 season. On may 29, he pitched the second complete-game shutout of his career, striking out 10 while winning a two-hitter against the Florida Marlins, 8–0; he also had two singles and an RBI, scoring twice, in the game. Kershaw produced his third career shutout on June 20, a two-hit, 11 strikeout effort against the Detroit Tigers. This game was of significance because Kershaw became the first Dodgers starter to strike out the side in the 9th inning since Sandy Koufax's perfect game. In his next start, on June 26, Kershaw pitched another complete game (against the Los Angeles Angels of Anaheim). He became the first Dodger starter to have back-to-back complete game victories since Jeff Weaver in 2005 and the first Dodger to have double digit strikeouts in consecutive starts since Chan-Ho Park in 2000. He was awarded the National League Player of the Week award for the week of June 20–26 as a result of those two starts. 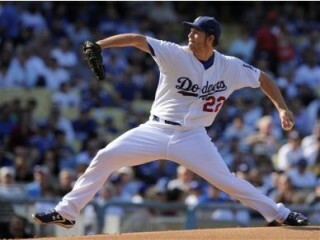 Kershaw gained his 20th victory on September 20, 2011, defeating the San Francisco Giants 2–1. He became the first Dodgers pitcher to go 5–0 against the Giants in a season since Vic Lombardi in 1946, beating two-time Cy Young winner Tim Lincecum four times. Kershaw finished the 2011 season with 21 wins, 248 strikeouts, and a 2.28 ERA, winning the NL pitching Triple Crown, the first Triple Crown winner since Jake Peavy in 2007 and the first Dodger since Sandy Koufax won it in 1966. The Detroit Tigers' Justin Verlander won the AL Triple Crown the same season, marking the first major-league season since 1924 to feature Triple Crown-winning pitchers in both leagues. Kershaw's 21 wins were the most by a Dodger pitcher since Orel Hershiser won 23 in 1988. His ERA was the lowest by a Dodger since Hershiser's 2.03 in 1985, his strikeouts were the most by a Dodger since Sandy Koufax's 317 in 1966 and his 233 1/3 innings pitched were the most since Chan Ho Park pitched 234 in 2001. After the season, Kershaw was awarded the Warren Spahn Award as the best left-handed pitcher in 2011, the USA Today National League Cy Young, the Players Choice Award for Most Outstanding National League pitcher, the Gold Glove Award as the top fielding pitcher in the NL and the NL TSN Pitcher of the Year. He was additionally selected as the starting pitcher for the Sporting News NL All-Star Team.On November 17, he was honored with the National League Cy Young Award, making him the youngest Cy Young winner since Dwight Gooden in 1985. He was the the 8th Dodger pitcher to the win the award, the first since Éric Gagné in 2003. View the full website biography of Clayton Kershaw .